I wanted to stay in bed, where it was warm and cosy, but forced myself to get up at 6:30am. It was cold and ice had formed on the tent and parts of my sleeping bag. I quickly took down the tent and strung it and the sleeping bag over a washing line I had set up in the hope that whatever breeze there was and the first rays of sunshine, when they appeared, would hasten the drying process. At 8:30am after breakfast and packing most of my gear I gave up on the sun and set out still wearing some warm gear. Despite the cold it was another beautiful morning and the early trail was level and followed along the edges of the Micalong Swamp, the largest montane swamp in mainland Australia (according to the guidebook). The Micalong Creek that I had been hiking up yesterday was fed by the swamp which was really on the top of a plateau. It was very peaceful and there were few signs of life looking across the vast swamp. The final section was crossed via a long boardwalk before my route began following an old disused fire trail gradually climbing through pretty eucalypt forest and then along a broad ridge leading westwards. I had some feeble mobile phone coverage for the first time in two days and, just as the trail began to descend from the ridge, I decided to use the phone reception to post my diary from two days ago. The link was flakey and it took longer than I had hoped and I decided to just update one day before continuing along the beautiful single-track down off the mountain. As the trail dropped, I could occasionally smell some smoke, though couldn't see any, and decided someone was burning off somewhere to the west. Lower down the mountain, the trail began to emerge from the wilderness and I encountered a couple of grassy clearings and deciduous trees, tell-tale signs of earlier settlement. There were also more blackberries bordering the track, a common occurrence the last few days, and every now and then my forearms would catch a branch and bleed. It's easy to see that parts of this trail could quickly get overgrown if left untended for a season or two. I reached a large grassy area with the remains of some corrugated iron buildings around mid-afternoon and stopped for a break and made an entry in the log book located there. Soon after I began walking again, along what was now an old disused farm trail, I heard a vehicle approaching and round a corner ahead of me came a quad bike piloted by a guy who looked about seventeen with a younger guy on the back (neither wearing helmets) using a sort of kerosene lighter to set fire to the undergrowth as they went. They stopped and I queried what they were doing and they said it was a National Parks controlled burn (to remove flammable undergrowth in the off-season). The driver said he thought I would be OK to continue on as the bush was a bit damp and the fire wasn't burning fiercely. Even standing talking to them I could feel the heat from the flames and the hairs on my arms singeing. I continued on with the fire bordering the track to my left and then hurried through a gap to where the fire line was now burning on my right and blowing towards me. I hurried on and, in another few hundred metres, the fire was well behind and all was OK, or so I thought. A kilometre further on the trail began descending down a steep slope and I could see smoke through the trees ahead. Soon I encountered fire on both sides of the trail and began to get a little concerned. The smoke made it difficult to see and the roar and crackling of the fire was all around and unnerving. I could tell the next hundred metres was either on fire or smouldering, but not what was further along. I retreated 50 metres, took off my pack, and then ran down the track past the flames and into the smoke to see how far I had to travel to cross the burning area (prepared to reverse direction quickly if it looked bad). It was about 100 metres to clear trail, so I ran back, retrieved my pack and then ran through. Unfortunately, I found the track was now zig-zagging down the steep burning slope and I had to keep crossing back through smouldering trail (is it burning the soles off my new boots?) past some trees, logs and bushes still burning fiercely. One patch of blackberries was roaring like an inferno and generating a lot of heat. Finally I descended below the fire, wondering about the wisdom of organising a controlled burn across a well-known trail on a sunny Sunday afternoon with no apparent warning signs. The last part of the afternoon involved climbing over the shoulder of a sizable mountain and then descending to the campsite at Thomas Boyd Trackhead. As I approached the Trackhead, I used my GPS to locate the drum of food I had secreted there two weeks ago and lugged it into the campsite. Almost at the same time, John, a Ranger, arrived by car and introduced himself. He works with Warwick Hull, who manages the Hume & Hovell Track and Warwick had asked him to check to see if I had arrived. We had a pleasant chat before John and some picnickers left and I had the very well appointed campsite to myself. There is hot water and I had a lovely wash, and there are lights in the shelters. I've decided to sleep in the shelter tonight as there's the possibility of rain and it makes departing faster in the morning. I typed up my diary while enjoying some corn chips and Diet Coke from my food drum. 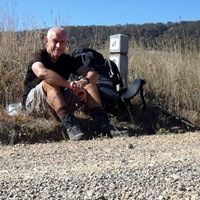 I'm thinking about hitch-hiking the 10km into Tumut tomorrow afternoon when my trail crosses the Snowy Mountains Hwy and staying there tomorrow night. It will give me a chance to recharge my phone and laptop and buy some extra gas and batteries I think I may need.